(1980) "11 O'Clock Tick Tock"
For the Dream Theater song, see Another Day (Dream Theater song). "Another Day" was U2's debut single release, and was released in 1980 following their EP, Three, and prior to their debut album, Boy. It was released only in Ireland. 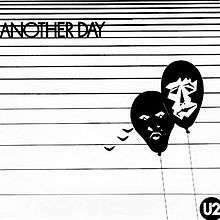 "Another Day" was produced by Chas deWhalley and U2 at CBS London, December 1979. The single was only released in Ireland and since it did not appear on any album or other CD pressing until the 2008 reissue of Boy, it was long considered a rarity in U2's catalogue. The B-side was an early demo of "Twilight," which was later re-recorded for its appearance on Boy and was regularly played live until 1984. ↑ Sams, Aaron; Kantas, Harry. "U2 – "Another Day" Single". U2songs.com. Retrieved 16 May 2016. Discography entry at U2songs.com – Comprehensive details on various editions, cover scans, lyrics, and more. Another Day's performance history at U2-Vertigo-Tour.com – Lists all concerts at which "Another Day" is known to have been performed. Twilight's performance history at U2-Vertigo-Tour.com – Lists all concerts at which "Twilight" is known to have been performed.